Among the most beloved characters from the Despicable Me movies, the Minions are adorable and goofy. You can be just as whimsical at your next costume party or Halloween event when you make your own Minion costume. This costume works for all ages, from babies to adults. The homemade portions of this Minion costume include the goggles, the hair, and the logo on the front of the overalls. You can find all the necessary supplies at your local craft store. If you have a little previous sewing experience, you can whip this up in less than an hour. Decide whether you want your Minion to have two eyes or a single eye. If you'll be making one with two eyes, you'll need to cut out two of each of the goggle pieces. 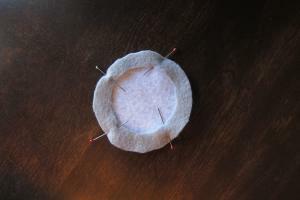 Place the smaller canning jar lid face down on the white craft felt and trace around the outside one time for each eye. Cut out the white circles and set them aside. Place the same lid face down on the gray felt and trace around the outside once for each eye. Before cutting these circles out, flip the lid over and line it up inside each circle. Trace around the inside of the lid so that you have a gray ring. Cut out each ring and set aside. Lay out the brown felt and place the spice jar lid on top of it. Trace around the outside of the lid once for each eye. Cut out these circles and set them aside. For each eye, cut a tiny circle out of the black felt. You can use the cap of your marker as a guide for drawing the circles. Cut these out as well. Put a white circle on your work surface and place the gray ring on top of it. Secure it with pins. Thread your sewing machine with gray thread and sew around the outside edge and the inside edge of the ring to secure it to the white circle. If you're making a two-eyed Minion, repeat with the other eye. If your Minion will have two eyes, cut a one-inch by half-inch rectangle out of the gray felt. Place this behind the two eyes so that it is entirely covered by the goggles but overlaps both lenses. Sew it in place to hold the two lenses together. Cut two six-inch by one-inch strips of black felt. Attach these to the sides of the goggles, behind the gray felt. Pin the brown circle near the center of the white circle. Use pins to secure it, and then use your sewing machine and brown thread to sew across it in a star pattern to make the iris for your Minion. Repeat with the other white circle and brown circle if your Minion will have two eyes. Thread your sewing machine with black thread. Add the small black circle to the center of the brown satin circle to create the pupil. You can hold it in place with pins and sew around it on the machine. Try the goggles on the person who will be wearing them and decide how much elastic you need to keep them snuggly in place. 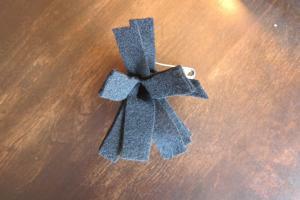 Sew the elastic on the ends of the black felt to create a headband. Next, place the black felt on your work surface and use a light-colored dressmaker's pencil to trace around the larger canning jar lid. Use the ruler to draw a square inside the circle you drew. Inside that, draw the G design for Gru Labs. You can see an example of the Gru logo on Amazon and purchase it as a vinyl decal if you wish. Once you've sketched the logo, cut it out of the felt. 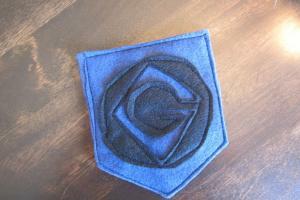 Cut two pocket shapes out of the navy blue felt and pin the black Gru logo to one of them. Use your sewing machine to attach it. Then stack the pocket shapes and sew all the way around the edges to create your Minion overall pocket. You'll be using safety pins to attach this to your costume. Create your Minion's hair by cutting the black non-adhesive craft felt into a rectangle that's about four inches wide by six inches long. Fold the rectangle in half lengthwise and make a fringe that's about a half inch wide. You can pin the fringe to the top of your hood to give your Minion parted hair. You can also fold it in half and roll it up to make a topknot. Simply safety pin the hair to the hood of your sweatshirt from underneath. Put on the sweatshirt, overalls, and black socks. Carefully pin the Gru logo onto the front of the overalls. Put the sweatshirt hood up and place the goggle headband over it and over your forehead. If desired, add a pair of black gloves. 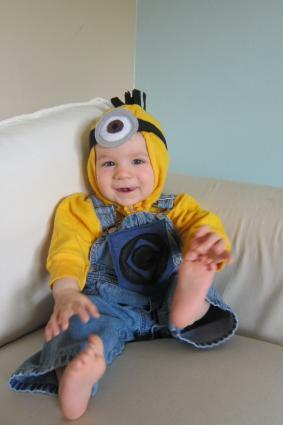 When you're ready to head to the party or out trick or treating with your Minion outfit, remember to act the part. The final element that will complete any Minion costume is the goofy smile.